H. Neiman; Walter Munch; William Lawrence; Hubbard Wilcox; William McOwen; Charles Shafer; John Cogan; W. T. Wetherel; Joel T. Davis; R. M. Spivey; C. S. Bowneau; James Sprague; J. C. Johnston; D. Ainsworth; Judge R. W. P. Muse; and L. E. Steele organized Harvey County on February 29, 1872. Named for James Harvey, Governor of Kansas 1869-1873, the county contains the cities of Burrton, Hesston, Halstead, Newton, North Newton, Sedgwick (part) and Walton. In April 1872, the Plymouth Congregational Church was organized in Sedgwick. The first county fair was held in 1872 sponsored by the Agricultural and Mechanical Association. The first fair was held on September 17, 18, 1873, in Newton. The fairs ended in 19l0 and it was not until 1945 that the first fair under the Harvey County Fair Association was held. 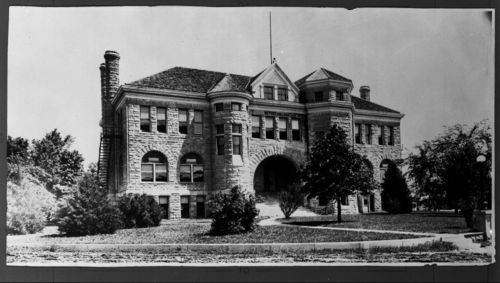 The first school building opened near Sedgwick in September 1870. Classes in Newton were first held in 1872 and the first school building in Newton was constructed and opened in 1873. Interesting public fig ures in the county include Dr. A. E. Hertzler, a nationally known doctor who founded the Halstead hospital, and the author of the best seller, Horse and Buggy Doctor (1938). Also Governor John McCuish (January 3, 1957-January 14, 1957), Congressmen Samuel R. Peters (1883-1891), and John M. Houston (1935-1943), and Kansas Supreme Court Chief Justice Alfred Schroeder (1977- ), who also served as a Justice (1957-1977), and Justice Adrian Greene (1901-1907) are all from the county. The novel Kinch, written by Matthew Braun and published in 1975, concerns the cow town days of Newton, particularly the events leading to the Newton General Massacre in Tuttle's Dance Hall on August 9, 1871. Interesting sites in the county include the Carnegie Library, the Warkentin House, the Old Mill, the Newton Station, the Railroad and Loan Building, the Neal House and the Bethel College Administration Building. For more information see the Harvey County website. Books, microfilm of newspapers, county records, and other information is available at the Newton City Library, the Harvey County Historical Society and the Mennonite Library and Archives at Bethel College in North Newton.